This week, Call of Duty's best and brightest bolted their studio like it was a track meet. There's plenty of suin' and stuff left that'll inevitably make this tale of woe even more entertaining. Why wait until court's in session? Today, class, your assignment is to create your best interpretation of Zampella et al. v. Activision or whatever the docket name is for the current crisis facing Infinity Ward's founders and their former employers. While one of the timelier 'Shop Contests we've run during this feature's short history, it's also one of the more open-ended. I don't have a specific image for you to doctor. But I do have the following source images to start your mind churning. Let's create a courtroom drama, if not worthy of video games, then at least worthy of television or cinema. Source Image: (from left) Jason West, some other guy, and Vince Zampella, formerly of Infinity Ward. Source Image: Activision's Bobby Kotick. Source Image: The Hon. Joseph A. Wapner. Source Image: Twelve Angry Men. Source Image: Inherit The Wind. 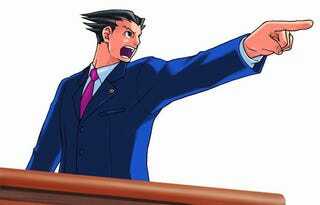 Source Image: Sigh ... Phoenix Wright objecting. Source Note: The Law & Order font is Fritz Quadrata. That plus black and white plus a lot of noise can create some humorous title cards. Now, there's a universe of images out there that may be more suitable for your purposes, so if one comes to mind, go for it. We're obviously gunning for the most humorous way possible to depict a multimillion dollar lawsuit between former business partners and all of the personal animosity that goes along with it. Our only ground rules: Keep your images no larger than 1200 pixels wide and 800 pixels tall. And, for God's sake, stop emailing them to me, tips and the Kotaku editors. It's silly to threaten anyone with sanctions for a contest that has no material reward, but I guarantee that emailing me your submission results in its automatic deletion. These are meant to be enjoyed by the community first. Then I'll pick 20 and post them in a finalist's gallery next Saturday. Alright, all rise for the honorable Kotaku Shop Contest!